125 card base set with card backs written by WWE announcer Michael Cole. Base set is a mix of current WWE superstars, Divas, Legends, and Hall of Famers. 11 card autographed relic checklist including John Cena, The Big Show, Edge, The Miz, Kofi Kingston, Christian, Evan Bourne, CM Punk, MVP, R-Truth, and Sheamus. 15 card autograph checklist including Kane, David Otunga, Chris Jericho, Kelly Kelly, Drew McIntyre, Alicia Fox, Maryse, Wade Barrett, and Caylan Croft. 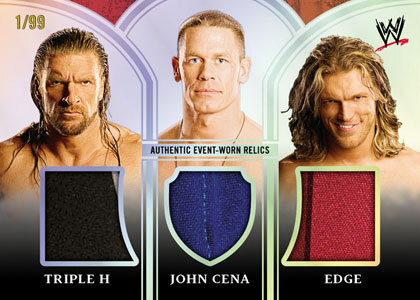 10 card Platinum Triple Relic set includes a John Cena-Triple H-Edge card. 25 card Platinum Performance insert set featuring the pairing of a present and past WWE superstar! 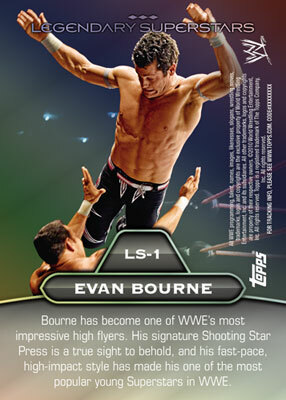 2010 Topps WWE Platinum Wrestling is a mid-high end wrestling card offering that features card backs written by WWE Announcer Michael Cole. WWE Platinum is set to release in late December of 2010 and will deliver 1 autographed relic, 1 autograph, and 1 relic per 24 pack hobby box.